1. Department of Biosynthesis of Nucleic Acids, Institute of Molecular Biology and Genetics, 150 Zabolotnogo street, Kyiv 03680, Ukraine. 2. Division of Endocrinology, Metabolism, and Bone Diseases, Mount Sinai School of Medicine, One Gustave L. Levy Place, Box 1055, New York, NY 10029, USA. The activation of extracellular signal-regulated kinases (ERK1/2) has been associated with specific outcomes. Sustained activation of ERK1/2 by nerve growth factor (NGF) is associated with translocation of ERKs to the nucleus of PC12 cells and precedes their differentiation into sympathetic-like neurons whereas transient activation by epidermal growth factor (EGF) leads to cell proliferation. It was demonstrated that different growth factors initiating the same cellular signaling pathways may lead to the different cell destiny, either to proliferation or to the inhibition of mitogenesis and apoptosis. Thus, further investigation on kinetic differences in activation of certain signal cascades in different cell types by biologically different agents are necessary for understanding the mechanisms as to how cells make a choice between proliferation and differentiation. It was reported that chitinase 3-like 1 (CHI3L1) protein promotes the growth of human synovial cells as well as skin and fetal lung fibroblasts similarly to insulin-like growth factor 1 (IGF1). Both are involved in mediating the mitogenic response through the signal-regulated kinases ERK1/2. In addition, CHI3L1 which is highly expressed in different tumors including glioblastomas possesses oncogenic properties. As we found earlier, chitinase 3-like 2 (CHI3L2) most closely related to human CHI3L1 also showed increased expression in glial tumors at both the RNA and protein levels and stimulated the activation of the MAPK pathway through phosphorylation of ERK1/2 in 293 and U87 MG cells. The work described here demonstrates the influence of CHI3L2 and CHI3L1 on the duration of MAPK cellular signaling and phosphorylated ERK1/2 translocation to the nucleus. In contrast to the activation of ERK1/2 phosphorylation by CHI3L1 that leads to a proliferative signal (similar to the EGF effect in PC12 cells), activation of ERK1/2 phosphorylation by CHI3L2 (similar to NGF) inhibits cell mitogenesis and proliferation. Keywords: chitinase 3-like 1 (CHI3L1, HC gp-39, YKL-40) protein, chitinase 3-like 2 (CHI3L2, YKL-39) protein, ERK1/2, MAP kinase). Investigation of the molecular mechanisms of proliferation and differentiation as an answer to cellular stimulation by certain growth factors led to the creation of a general concept, as to how the cell itself makes a choice regarding further development. The reaction of the cell to definitive stimuli is mediated by signal events, which are specific to the cell and to the localization of necessary transcription factors. Further investigations on kinetic differences in activation of certain signal cascades by different bio-active agents are necessary for the understanding of the mechanisms that determine the destiny of different cells. Determination of adequate cell response to the specific stimuli is thought to be dependent on the duration of ERK1/2 activity . NGF stimulation of PC12 cells gave the sustained activation together with the nuclear translocation of ERK1/2, which led to the neuronal differentiation, while EGF gave short activation of ERK1/2 without change in cellular localization, resulted in a proliferative signal . Plenty of ligands provoked significantly similar set of expressed immediate-early genes in PC12 cells and fibroblasts , however, resultant cell phenotype may be very distinct. Mammalian genomes code a set of homologous CLPs regardless the absence of chitin (poly-N-glucosamine) synthesis in mammalian species. According to classification based on amino acid sequence similarities, CLPs have been grouped in a family 18 glycosyl hydrolases . In humans there are six proteins of this family  and CHI3L1 is the most highly investigated protein of the group. It has a molecular weight of about 40 kDa and N-glycosylation at Asn60. CHI3L1 monomer consists of 383 amino acid residues, contains a signal peptide Met1-Ala21 for secretion and two structural domains. The expression of the CHI3L1 gene was found in synovial cells and articular cartilage chondrocytes. It is increased significantly in various tumors, and cell lines derived from such tumors, including tumors of the bone, brain, breast, lung, and ovary . Increased CHI3L1 gene expression was found in glioblastoma and may be a survival marker [7-10]. It was shown recently, that CHI3L1 protects against apoptosis  and possesses oncogenic properties . CHI3L1 addition to human synovial cells as well as to skin and fetal lung fibroblasts activated MAPK and PI3K signaling pathways which were involved in mediating the mitogenic response. Dose-dependent growth stimulation occurred in a concentration range similar to the well-studied mitogen IGF1. Selective inhibition of the MAPK and AKT signaling pathways indicates that both are necessary for mitogenic effect of CHI3L1. Thus, CHI3L1 may have growth factor properties for the connective-tissue cells . Chitinase 3-like 2 (CHI3L2) is closely related to CHI3L1 and has significant sequence homology (49-53%) with other mammalian CLPs. A clue to its function was gained from the structural similarity with CHI3L1 in size, nucleotide and amino acid sequences (47% and 51% homology, correspondingly), they have the same NH2-terminal amino acid residues as noted in their alternative names (YKL-40 and YKL-39). CHI3L2 was originaly isolated from the cultured medium of primary human articular cartilage chondrocytes as a protein that co-purified with CHI3L1 . Previously, we revealed an increased expression of both, CHI3L1 [7, 9] and CHI3L2  genes in glioblastoma. However, Western blot analysis did not show simultaneous production of CHI3L1 and CHI3L2, apparently indicating their different functions. As we have found recently, CHI3L2 similarly to CHI3L1 also activated ERK1/2 phosphorylation in cells of tumor and non-tumor origin . The work described here demonstrates the role of CHI3L1 and CHI3L2 in the control of mitogenesis and proliferation as well as the influence of CHI3L1 and CHI3L2 on the duration of MAPK cellular signaling and phosphorylated ERK1/2 nuclear translocation in 293 cells and U373 cells as a comparison to that observed for EGF or NGF in PC12 cells. 293 cells (Human Embryonic Kidney 293 cells, also often referred to HEK 293, or less precisely as HEK cells) and U373 cells (Human glioblastoma-astrocytoma, epithelial-like cell line) kindly provided by Prof. I. Gout (UCL, Cell Signaling and Metabolic Regulation Dept., UK) were grown in DMEM supplemented with 10% FBS and 100 µg/ml penicillin/100 units/ml streptomycin in an environment of 95% air/5% CO2. Mitogenic activity was assessed by determination of DNA-synthesis rates of treated and untreated cultures. 293 cells or U373 cells were seeded into 24-well tissue-culture plates and allowed to grow to near-confluence in DMEM supplemented with 10% FBS, followed by a 24 hrs serum-starvation period in unsupplemented DMEM. CHI3L1, CHI3L2 or FBS were then added in DMEM at the concentrations indicated, followed by [3H]thymidine (3 µCi/ml) 2 hrs later. Cultures were terminated after 24 hrs of exposure and the cell layers were briefly washed twice by PBS and lysed in 0.5 M NaOH, 0.5% SDS. DNA was collected on glass-fiber filters and washed with 5% trichloroacetic acid. [3H]thymidine content was determined by liquid scintillation spectroscopy using a Perkin Elmer scintillation counter. 293 cells and U373 cells were treated as for the assessment of mitogenic activity described above or exposed to the ERK1/2 inhibitor U0126 (20 µM) for 30 min and then stimulated with 100 ng/ml CHI3L1 or CHI3L2 for 60 min. Cellular proliferation was estimated using the CellTiter 96 AQueous One Solution cell proliferation assay kit (Promega, Madison, WI). 20 ml of 2-(4',5'-dimethyl-2'-thiazolyl)-3-(4'-sulfophenyl) (MTS) solution was added to each well. The plate was kept for 4 hrs in a CO2 incubator, and the absorbance at 490 nm was recorded with 96-well plate reader. The background readings in the wells with medium were subtracted from the sample well read outs. 293 cells and U373 cells were treated as for the assessment of mitogenic activity described above. For activated caspase-3/7 analysis, cells were incubated for 1 hr with reconstituted Caspase 3/7-Glo reagent (Promega) and then, the luminescence signal generated after cleavage of DEVD-aminoluciferin substrate by caspase 3/7, was measured using 96-well plate reader. Native CHI3L1 purified from supernatant of conditioned MG-63 cell (Human osteosarcoma cell line) medium  was kindly provided by Dr. A. Iershov (Department of Biosynthesis of Nucleic Acids, Institute of Molecular Biology and Genetics, Kyiv, Ukraine). Synthesis of recombinant CHI3L2 was performed according to our previous description . Protein products were analyzed by 12 % SDS-PAGE and Coomassie Brilliant Blue R250 staining. Purified CHI3L1 and CHI3L2 were stored frozen at -20°C in aliquots to avoid repeated freeze-thawing and denaturation. Antibodies were obtained from multiple sources and used at the specified dilutions for immunofluorescence microscopy: p44/42 MAP (Erk1/2) (L34F12) Mouse mAb (Cell Signaling Technology, Danvers, MA) 1:100 (anti-phospho-ERK); ERK1 (K-23) Rabbit polyclonal IgG (Santa Cruz Biotechnology, Santa Cruz, CA) 1:100 (pan-anti-ERK); Fluorescein Anti-Mouse IgG (H+L) as well as Texas Red® Anti-Rabbit IgG (Vector Laboratories Inc., Burlingame, CA) 1:400; and for immunoblots: pERK (E-4) Mouse monoclonal IgG (Santa Cruz) 1:2000 (anti-phospho-ERK); ERK1 (K-23) Rabbit polyclonal IgG 1:3000 (pan-anti-ERK); Anti-Mouse IgG (H+L), HRP Conjugate and Anti-Rabbit IgG (H+L), HRP Conjugate (Promega) 1:20000 (HRP-anti-mouse IgG), (HRP-anti-rabbit IgG). The reagents for enhanced chemiluminescence (ECL) from Sigma-Aldrich Co. and Fluka (Buchs, Switzerland) were used for the visualization of immunoreactive bands on Western blots. The MAP kinase kinase (MEK) inhibitor U0126 was obtained from Cayman Chemical (Ann Arbor, MI). For investigation of ERK1/2 phosphorylation 293 cells or U373 cells were seeded into 6-well tissue culture plates in 10%FBS contained DMEM and allowed to grow to near-confluence. Cells were serum-starved for 24 hrs or exposed to the ERK1/2 inhibitor U0126, as described above followed by addition of 100 ng/ml CHI3L1 or CHI3L2 for time periods up to 2 hrs. At the end of the incubation periods, cell layers were washed twice in ice-cold PBS and whole cell lysates were mixed with 2× Laemmli sample buffer, boiled, proteins resolved by 10 % SDS-PAGE and transferred to nitrocellulose membrane. Membranes were blocked for 1 hr at room temperature with 5% powdered skim milk in TBS with 0.05% Triton X-100 (TBST), reacted with anti-phospho-ERK at 4°C overnight, and then incubated with HRP-anti-mouse IgG for 1 hr. Blots were developed with an ECL detection system. Membranes were incubated in stripping buffer (0.5 M NaCl, 0.2 M Gly, pH 2.5) for 15 min at 70°C, and then they were washed twice in TBST, blocked, and incubated with pan-anti-ERK for 1 hr at room temperature. After incubation with HRP-anti-rabbit IgG for 1 hr, total ERK1/2 was detected with ECL. Specific activation of MAP kinases was measured by densitometric analysis of Western-blot signals using Scion Image 1.62c program (NIH ImageJ; NIH, Bethesda, MD). 293 cells were seeded on coverslips and allowed to grow to near-confluence. Cells were then serum-starved for 24 hrs, followed by exposure to CHI3L1 or CHI3L2 at 100 ng/ml for time period up to 2 hrs. After treatment, the cells were washed in cold PBS, fixed with 10% paraformaldehyde and permeabilized in -20°C methanol, washed three times for 5 min each with PBS and blocked with blocking buffer (2% BSA in PBS) for 30 min at room temperature. Incubations were performed at room temperature with antibodies diluted in blocking buffer. Slides were mounted using PVA-DABCO (Fluka) and images were captured with a Zeiss LSM 510 Meta confocal microscope (Germany). All images represent a single confocal section, taken from the bottom surface of the cells being analyzed. Comparisons between two groups were done by using the independent samples t test. A value of P<0.05 was considered statistically significant. The influence of CHI3L2 protein application on the mitogenesis and growth of 293 cells and U373 cells, was evaluated by incorporation of [3H]thymidine into cellular DNA and proliferative activity using the MTS test. Unexpectedly, in contrast to CHI3L1, a dose-dependent decrease of [3H]thymidine incorporation (Figs. 1A, B) and cell proliferation (Figs. 1C, D) was observed in the cells treated with CHI3L2 at concentrations of 50, 100 and 200 ng/ml. The magnitude of the response decreased by 8,5±16% fold (for 293 cells) or 3,7±38% fold (for U373 cells) in [3H]thymidine incorporation and 3,9±48% (for 293 cells) or 4,3±61% (for U373 cells) in proliferation compared to that elicited by 10% FBS and CHI3L2 (200 ng/ml). It was decreased by 2±24% fold (for 293 cells) or 1,7±32% fold (for U373 cells) in [3H]thymidine incorporation and 2,1±50% in proliferation for both cell types compared to that elicited by untreated cells and cells treated with CHI3L2 (200 ng/ml). The simultaneous addition of both chitinase-like proteins showed the inhibition of [3H]thymidine incorporation in 293 cells and U373 cells stimulated with CHI3L1 addition alone (Figs. 2A, B), and vice versa, the apoptotic influence of CHI3L2 was inhibited with CHI3L1 addition (Figs. 2C, D). Effect of CHI3L1 and CHI3L2 on 293 cells and U373 cells growth. 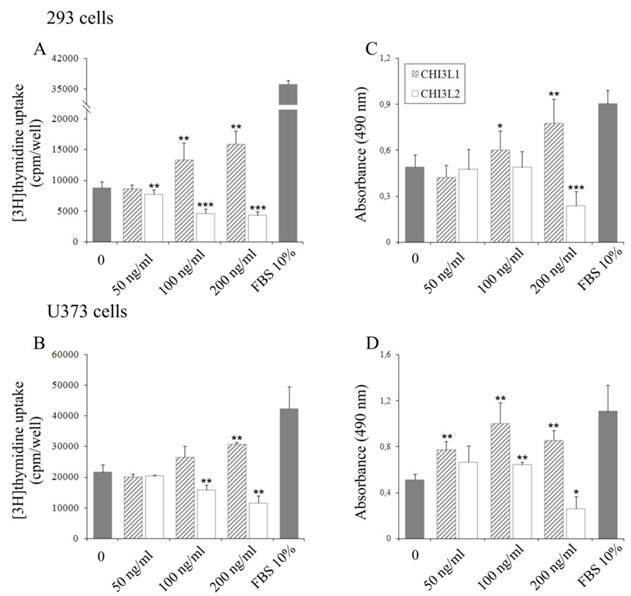 Dose-dependent effect of CHI3L1 and CHI3L2 application on [3H]thymidine incorporation in 293 cells (A) and U373 cells (B). Dose-dependent effect of CHI3L1 and CHI3L2 on 293 cells (C) and U373 cells (D) proliferation. *p < 0.05, **p < 0.01 and ***p < 0.001 vs control group. Values were means±SD (n=6). CHI3L2-inhibition of CHI3L1 proliferative effect and CHI3L1-inhibition of CHI3L2-inducible apoptosis in 293 cells and U373 cells. 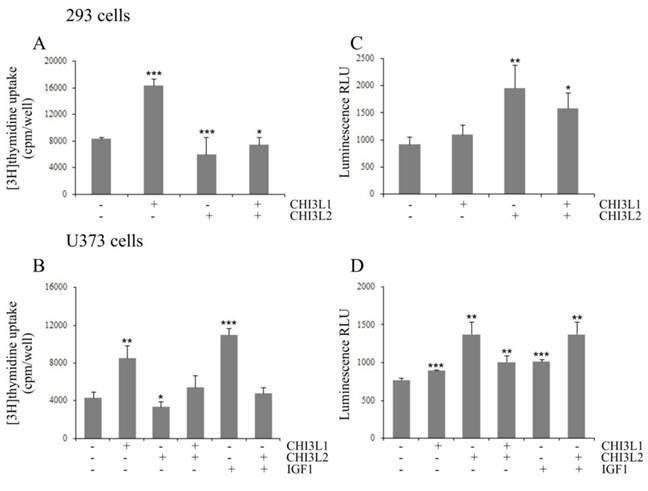 Cultured 293 cells (A, C) or U373 cells (B, D) were untreated (0 ng/ml), treated for 24 hours with CHI3L1, CHI3L2, or IGF1 (concentrations indicated) and treated with a mixture of these proteins. (A, B) DNA synthesis rate analyzed by [3H]thymidine incorporation evaluation. (C, D) Caspase 3/7 activity determined by a caspase 3/7-Glo assay. *p < 0.05, **p < 0.01 and ***p < 0.001 vs control group. Values were means±SD (n=6). The mitogen-activated protein kinase pathway is strongly associated with cell proliferation and survival. In this investigation to examine whether CHI3L2 can stimulate the MAP kinase pathway similarly to the closely related CHI3L1 protein we used human glioblastoma U373 cells. 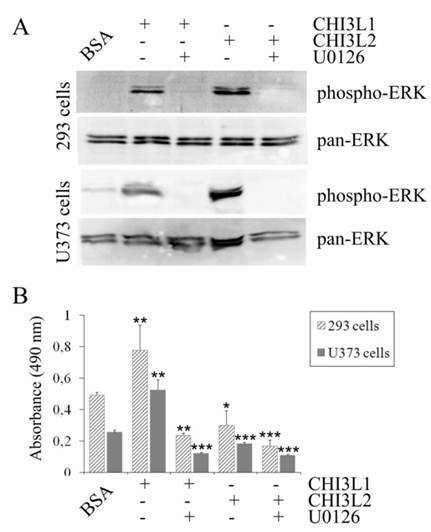 Same as with 293 cells , the obtained results indicate that addition of CHI3L1 or CHI3L2 stimulated ERK1/2-phosphorylation in U373 cells in a dose-dependent manner (Fig. 3A). These cells, similarly to 293 cells, but in contrast to other glioblastoma cell line U87  produce neither CHI3L1 nor CHI3L2 protein (Fig. 3B). No ERK1/2 phosphorylation was observed in cells exposed to medium without CHI3L1 or CHI3L2 addition. The phosphorylation of ERK1/2 and cell proliferation were inhibited by the MAP kinase kinase (MEK) inhibitor U0126, as expected (Fig. 4A, B) suggesting that MAP kinase-dependent signaling events modulate the cell response on CHI3L1 or CHI3L2 treatment. In 293 cells, activation of ERK1/2 by CHI3L2 was more sustained (reaching a maximum after 60 min) than by CHI3L1 (reaching a maximum after 20 min), and declined after 2 hrs only by ~30 % while after activation by CHI3L1 it declined approximately to basal level (Figs. 5A, B). We were therefore interested to determine whether the difference in kinetics of ERK1/2 activation by CHI3L1 and CHI3L2 was accompanied by differences in phosphorylated ERK1/2 nuclear translocation. Results indicated that unstimulated 293 cells did not contain nuclear pERK1/2. After 5 min of stimulation by CHI3L1 nuclei (Fig. 5C) became brightly fluorescent, and even more so after stimulation by CHI3L2 (Fig. 5D). Dose-dependent phosphorylation of ERK1/2 induced by CHI3L1 and CHI3L2. (A) Western-blot analysis of U373 cells with anti-phospho-ERK and pan-anti-ERK antibodies after CHI3L1 or CHI3L2 cell treatment (60 min). (B) Western-blot analysis of U373 cell, 293 cell, and MG-63 cell media or purified CHI3L1 and CHI3L2 proteins with anti-CHI3L1, -CHI3L2 or -ACTB antibodies. Influence of U0126 inhibitor on activation of ERK1/2-mediated MAPK signaling pathway. (A) 293 cells and U373 cells were serum-starved and exposed or not exposed to the ERK1/2 inhibitor U0126 (20 µM) for 30 min prior to addition of CHI3L1 or CHI3L2 (100 ng/ml). Cell lysates were prepared after 60 min of stimulation and levels of phosphorylated and total ERK1/2 were analyzed as described for Figure 3 A. (B) Cell proliferation rate of 293 cells and U373 cells exposed or not exposed to the U0126 inhibitor after CHI3L1 or CHI3L2 (200 ng/ml) stimulation (24 hrs). *p < 0.05, **p < 0.01. Values were means±SD (n=6). Time course of CHI3L1- or CHI3L2-induced ERK1/2 phosphorylation and nuclear accumulation in 293 cells and U373 cells. (A,E), Time course of ERK1/2 phosphorylation by CHI3L1 or CHI3L2 (100 ng/ml) treatment in 293 cells(A) or in U373 cells (E) . (B, F) Densitometric analysis of Figure A (B) or Figure E (F). Results are expressed as fold of phosphorylation of ERK1/2 compared with total ERK1/2. (C, G) Phosphorylated ERK1/2 cellular localization invoked by CHI3L1 in 293 cells (C) or in U373 cells (G). 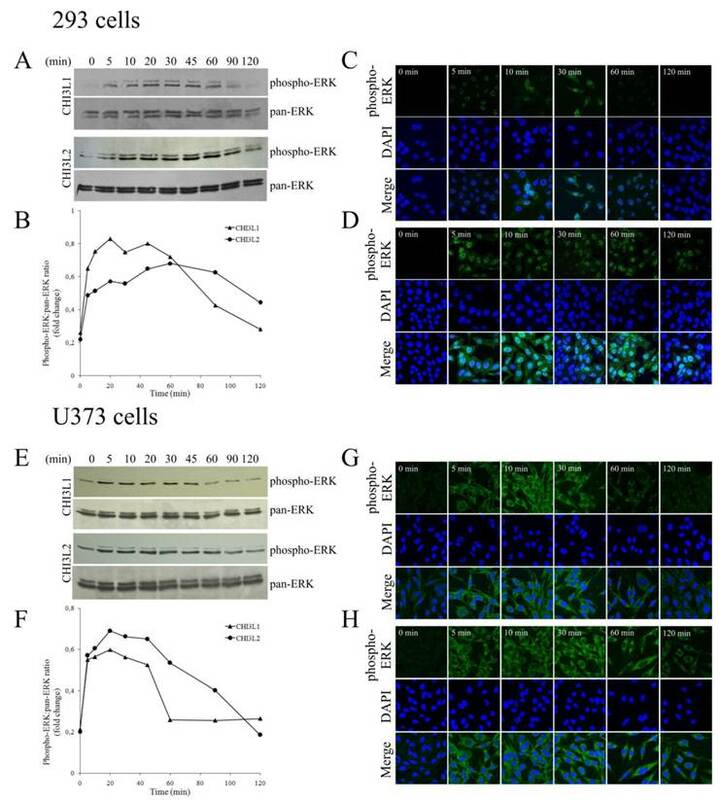 (D,H) Phosphorylated ERK1/2 cellular localization invoked by CHI3L2 in 293 cells (D) or in U373 cells (H). Key functional motifs of human CHI3L1 and CHI3L2. Pairwise sequence alignment was produced with ESPript 2.2. Elements of secondary structure of CHI3L1 are shown. B - basic amino acid, X - any, but proline. In contrast to incubation with CHI3L1 that resulted in the maintenance of the pERK1/2 nuclear localization no longer than 30 min (Fig. 5C), nuclear fluorescence peaked at 10 min after CHI3L2 stimulation and was maintained for more than 2 hrs (Fig. 5D). In U373 cells, the observed ERK1/2 activation by CHI3L1 and CHI3L2 was quite similar to 293 cells, peaking in 20 min and declining to basal level in 60 min after CHI3L1 or in 120 min after CHI3L2 treatment (Fig. 5E, F). However, in contrast to 293 cells, localization of activated ERK1/2 was found only in the cytoplasm of U373 cells without nuclear translocation (Figs. 5G, H). So, CHI3L1 and CHI3L2 have not only different effects on the kinetics of ERK1/2 phosphorylation, but have also different effects on cellular localization of these enzymes in 293 cells compared to U373 cells. What is the mechanism(s) whereby CHI3L1, which activating ERK1/2 phosphorylation, leads to the mitogenesis and proliferation, and has oncogenic properties whereas CHI3L2, which also activates ERK1/2 phosphorylation, leads to the decrease of mitogenesis and proliferation and may lead to differentiation? CHI3L1 and CHI3L2 belong to the chitinase-like family of proteins, but lack chitinase activity due to the mutation in the catalytic centre. These proteins are quite closely related (51% homology), have same NH2-terminal aminoacid residues, and their 3-dimensional structures are also very similar . The diversity in their functional activities could be explained, firstly, by the fact that native CHI3L1 is glycosylated at Asn60 while CHI3L2 is not a glycoprotein. Besides, CHI3L1 has a cluster of basic residues which can bind heparin; CHI3L2 has a different amino acid sequence in this site. Third, in the ligand-binding groove CHI3L1 has two tryptophan residues, in CHI3L2 these tryptophans are mutated to lysines which change the protein charge and hydrophobicity (Fig. 6). Insights into the relationships between these features and tumorigenicity require further investigation. Although the investigation of CHI3L1 was mainly focused on its expression patterns in a number of pathological conditions , СHI3L2 the most closely related protein to CHI3L1 in the family 18 glycosyl hydrolases, is very poorly characterized. The growth-stimulating properties of one member of mammalian CLPs  may lead to the suggestion about conservation of this function throughout all members of the family. The results presented by Recklies et al. indicate that CHI3L1 is a strong inductor of MAPK and PI3K signaling pathways in human connective tissue cells, mediating its action through the phosphorylation of ERK1/2 and AKT, respectively. Their finding fits with the highly investigated roles of these signaling pathways in the transduction of mitogenic signals [21-23]. In this study, ERK1 and ERK2 phosphorylation in 293 cells and U373 cells as well as in U87 cells  was induced by both CHI3L1 and CHI3L2. However, activation of ERK-mediated cellular signaling cascade can be associated with stimulation of mitogenesis and proliferation as in the case of CHI3L1 or inhibition of mitogenesis and proliferation as in the case of CHI3L2. PC12 cells have been extensively used as a model for study of how different receptor induction of ERK1/2 phosphorylation determines mitogenesis and proliferation or inhibition of mitogenesis and differentiation. Insights from these works suggest that cells make decisions about proliferation or differentiation using different duration of ERK1/2 activation and their localization: sustained ERK1/2 phosphorylation is associated with ERKs translocation to the nucleus while transient is not accompanied by nuclear translocation . Transcription of genes important for differentiation or cell-cycle regulation, as well as stabilization of proteins, such as immediate early gene products, is regulated by duration and localization of ERK1/2 activity. Thus, the qualitative and quantitative differences in ERK1/2 activity lead to changes in gene expression that determined specific outcomes. However, as it was discussed by Marshall , this model is based wholly on experiments on PC12 cells which may represent a very abnormal system. In our investigation, we observed that sustained ERK1/2 activation by CHI3L2 stimulated the translocation of these kinases into the cell nuclei, whereas transient ERK1/2 activation by CHI3L1 did not demonstrate such translocation similarly to the effects, described previously for NGF and EGF, correspondingly, in PC12 cells. Thus, we obtained the same effect with another cell type, namely, human 293 cells, where transient or sustained ERK1/2 activation leads either to stimulation or to inhibition of mitogenesis, respectively, and strongly supports the paradigm described for PC12 cells. However, in fibroblasts sustained activation of ERKs was not associated with differentiation . In glioblastoma-derived U373 cells (same as in the case of glioblastoma-derived U87 cells ) the phosphorylation of ERK1/2 was observed even without growth factors CHI3L1 or CHI3L2 addition, but reached a maximum after 20 min and declined after 2 hrs approximately to basal level after either CHI3L1 or CHI3L2 application. Activation of the ERK1/2 pathway is a normal response of the cell following stimulation of growth factors receptors by proper ligands. However, the identity of cellular receptors mediating the biological effects of CHI3L1 and CHI3L2 are currently not known, but the activation of cytoplasmic signal-transduction pathway suggests that these CLP's interacts with signaling components on the plasma membrane. ERK1/2-mediated pathway is shown to be inadequately activated in a variety of tumor cell lines and tumor tissue as it was shown here for the glioblastoma U373 cell line. In these cells all of the activated ERK1/2 remains in the cytoplasm without cytoplasm-to-nucleus translocation even after 2 hrs of cell stimulation. Transient activation will therefore have very different consequences for gene expression compared with sustained activation in the cells of different origin because nuclear accumulation of active ERKs will result in phosphorylation of different transcription factors. Determination of the cellular response depending on previous developmental events that determine which ERK-responsive transcription factors are present in the 293 cells and U373 cells is the purpose of further investigations. We thank Dr. S. Karakhim for providing expertise and access to Zeiss confocal microscope, Dr. I. Skrypkina for help in immunofluorescence analysis. This work was supported in part by Science & Technology Center in Ukraine (Project 4688) and by National Academy of Sciences of Ukraine in frames of the program “Fundamentals of Molecular and Cellular Biotechnology”. ACTB, β-actin; AKT, protein kinase B; BSA, bovine serum albumin; CHI3L1, chitinase 3-like 1; CHI3L2, chitinase 3-like 2; CLP, chitinase-like protein; DMEM, Dulbecco's modified Eagle's medium; EGF, epidermal growth factor; ERK, extracellular signal-regulated kinase; FBS, fetal bovine serum; FGF, fibroblast growth factor; IGF, insulin-like growth factor; MAPK, mitogen-activated protein kinase; NGF, nerve growth factor; PAGE, polyacrylamide gel electrophoresis; PC12, rat adrenal pheochromocytoma cell line; PBS, phosphate buffered saline; SDS, sodium dodecyl sulphate; TBS, Tris buffered saline. Corresponding author: Derek LeRoith, the Division of Endocrinology, Metabolism, and Bone Diseases, Mount Sinai School of Medicine (e-mail: derek.leroithedu).